The biggest shopping day of the year was a huge victory for bitcoiners and is proving that this new currency is approaching mass adoption. The website BitcoinBlackFriday.com reported over 500 websites that offered one day deals in bitcoin and from the looks of it people responded with purchases of all kinds of cool things for bitcoin. 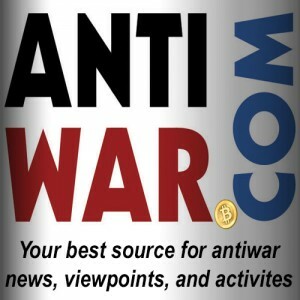 We got in on the action and was listed with other great charities such as AntiWar.com, Fr33Aid, the BitGive Foundation along with several other organizations collecting donations or offering a part of sales to aid in relief efforts in the Philippines. 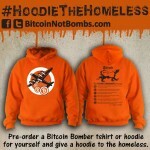 Bitcoin not Bombs is wrapping up our #HoodieTheHomeless campaign and is offering free international shipping along with some other fun items in our shop. We are still accepting orders for our Bitcoin Not Bomb t-shirts and hoodies and have extended our Black Friday deal until the end of Cyber Monday (Now called #CryptoMonday). You can still order a shirt or hoodie for your self and help someone in need this winter. 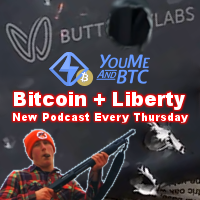 Read more about our Hoodie the Homeless project here or check out this fun video produced by our friend Tom of The Bitcoin Group. We are continuing to raise funds to buy the reaming discontinued hoodies offered to us at a discount by Mass Appeal. Prices below are set to cover the cost one for one. The hoodies that are being offered to you the public are not from the same discontinued batch and is right from the supplier. Plus size hoodies are marked higher. We are offering free international shipping in celebration of Bitcoin Black Friday and have extended that offer through Crypto Monday. The ordering process is not 100% automated and we will be contacting you and asking for your size preference. You can donate directly to this project with the bitcoin address below. From the end of our Bitcoin Starter campaign (10/10) until now we have received 0.717 BTC and will apply that to ordering more hoodies for people in need. We have full accounting of donations made to this address and thank you in advance for your anonymous support! How much is non-US shipping? When I order I get to the payment page, but it doesn’t mention shipping rates. Would love to get a hoodie in South Africa! Go ahead and place the order like normal. We’re offering free international shipping. I’ll make sure it happens.